Two airmen are described as "fine" after their RAF Tornado crashed into The Wash close to a practice bombing range in Lincolnshire. The Ministry of Defence (MoD) said the incident happened on Tuesday morning at Holbeach Range. 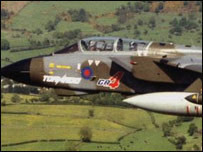 It is thought the two-seater GR4 Tornado from RAF Marham in Norfolk was using the range. The airmen were taken to hospital in King's Lynn. An inquiry has been launched into the cause of the crash. The crew were picked up from the sea by Sea King helicopters from the Wattisham Army Base and RAF Leconfield, near Beverley, East Yorkshire. Air Commodore Greg Bagwell, from RAF Marham, said: "I've spoken to the crew and they're fine. "We've already set up an inquiry that will go through the full process to establish the reasons and causes of the crash and we will act upon that." Michael Mulford, from the RAF rescue co-ordination centre at Kinloss, said the airmen will be checked for spinal injuries. "Everyone who ejects is liable to have some back trouble or back pain and it's a question of just working out how they have come through the ejection," he said. Holbeach Range is north of Holbeach and is used as a bombing range by Tornados, Harriers and Jaguar aircraft. Practice bombs are dropped on a variety of targets on the range, which is based on the south side of The Wash. The Tornado GR4, which costs around £30m, is considered as the RAF's primary attack aircraft, flying at low level and supersonic speeds. The two engine aircraft can reach top speeds of 1,452mph at 36,000ft (10,972m) and 710mph at sea level. RAF Marham operates four squadrons of Tornado GR4 and each aircraft carries a pilot and a navigator. A Tornado GR4 from the base crashed into the Humber estuary on 17 May 2002. Both crew members ejected to safety.